When Amy Robsart and Robert Dudley married in 1550, it was a love match, or “a carnal marriage, begun for pleasure” as Baron William Cecil described it. But there had always been another woman in his life, Queen Elizabeth I, who he’d known since childhood. They were both imprisoned in the Tower at the same time (during the reign of Queen Mary), and the shared experience drew them ever closer. After Elizabeth ascended the throne in 1558, she appointed Dudley as her Master of the Horse, a position that allowed them to see each other daily. From that point on, Amy was put on the shelf, with Robert only sending her occasional presents and otherwise avoiding seeing her completely. It didn’t take long for the rumor mill to get going about the young Queen’s obvious favor for Robert Dudley – wife or no wife. During the last few days, Lord Robert has come so much into favour that he does whatever he likes with affairs. It is even said that Her Majesty visits him in his chamber day and night. People talk of this freely that they go so far as to say that his wife has a malady in one of her breasts (breast cancer), and that the Queen is only waiting for her to die to marry Lord Robert. 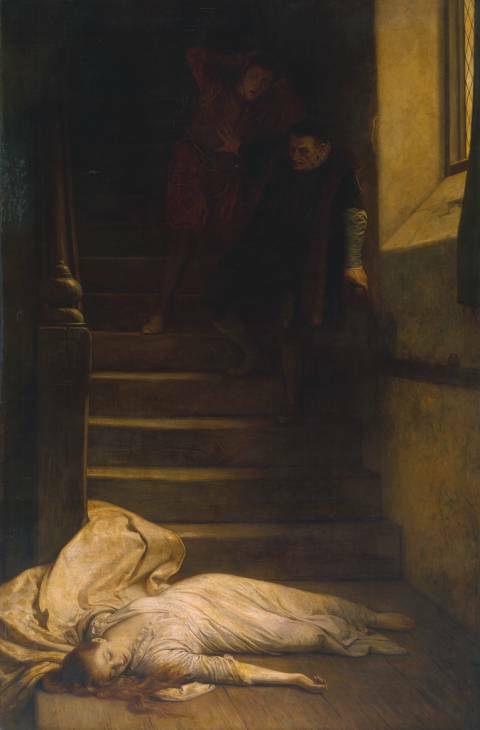 This brings us to September 8, 1560, when Amy Robsart Dudley was found dead at the foot of a staircase at her home in Oxfordshire, England. Robert was not in residence at the time. When Robert learned of Amy’s fall, he ordered an immediate inquest and the cause of her death was ruled as accidental. Considering the main players and the high stakes involved, this pronouncement did nothing to keep suspicions from growing and rumors from spreading. Dudley suspected this might be the case, and so requested the matter be re-investigated, this time by a panel that included some of Amy’s friends and her half-brothers, just so no one could say the original jurors were biased in favor of himself. This suggestion was not heeded. The fact that The Queen’s Council despised Dudley didn’t much help his cause. They were quite content to see his chances of marrying Elizabeth go down the drain- whether it was justified or not hardly mattered. After all, Dudley did want to marry the Queen, and he couldn’t do that with Amy still in the picture. So, despite the ruling and evidence in favor of Robert having nothing to do with it, and that Robert Dudley seemed genuinely distressed and completely unprepared for what happened to his wife (with his distress probably having more to do with wanting to avoid any potential scandal given his aspirations to marry the Queen, rather than that Amy was dead), his enemies whispered. Because he was at Windsor with the Queen at the time, those who thought he was behind his wife’s death surmised he paid his squire, Sir Richard Varney, to bump his wife off. Or maybe William Cecil, Queen Elizabeth’s ever-devoted courtier, arranged Amy’s murder to get back in his Queen’s good graces at the expense of Dudley, a man he hated with every fiber of his being. But it’s hard to imagine him risking his beloved Elizabeth’s reputation by creating such a scandal. was so earnest to have them gone to the fair, that with any of her own sort that made reason of tarrying at home she was very angry, and came to Mrs. Odingsells … who refused that day to go to the fair, and was very angry with her also. Because [Mrs. Odingsells] said it was no day for gentlewomen to go … Whereunto my lady answered and said that she might choose and go at her pleasure, but all hers should go; and was very angry. They asked who should keep her company if all they went; she said Mrs. Owen should keep her company at dinner; the same tale doth Picto, who doth dearly love her, confirm. Certainly, my Lord, as little while as I have been here, I have heard divers tales of her that maketh me judge her to be a strange woman of mind. Did she take the opportunity to commit suicide? She had reportedly been markedly depressed, but in those days, taking one’s life most thought of as a guarantee to earn one eternal hell-fire. Is this what Amy believed? Was she so depressed she didn’t care? Let’s get back to that “malady of the breast.” By many accounts, Amy Rosbart Dudley seemed to be suffering from breast cancer. This would certainly be enough to render a woman melancholic, especially one who may have been feeling her husband was waiting for her to die to marry another. That would tie everything together nicely, except the coroner also noted two head wounds, one “of the depth of a quarter of a thumb”, and the other “of the depth of two thumbs.” These types of injuries may have been from being attacked, or may have simply occurred during her fall as was speculated at the time. In the end, the jury ruled her death accidental, but that hasn’t stopped people from then to now studying the case in hopes of figuring out if there was something more to it than that. Did Dudley Murder His Wife?